A new $6 million grant from the National Science Foundation's EPSCoR program will fund a four-year study examining the future of dams in New England. This project marks an expansion in partners and scope for the New England Sustainability Consortium (NEST), adding Rhode Island to the existing partnership between Maine and New Hampshire. NEST was launched in 2013, when Maine and New Hampshire began an innovative collaboration focused on increasing the safety of coastal beaches and shellfish beds that are threatened by bacterial pollution and other microbial pathogens. NEST is designed to respond to societal challenges where economic and community development goals need to be balanced with environmental protection. Such sustainability objectives are not only of central importance in New England, they also represent national and global imperatives. This new tri-state collaboration will strengthen connections between scientists and decision-makers about a number of potential dam options, including maintaining existing hydropower dams, expanding hydropower capacity, and removing aging dams to restore fisheries or reduce safety risks. By examining economic, environmental, and social tradeoffs, the project will help individuals and communities make better decisions about dams. As project lead Paul Kirshen, research professor of Civil and Environmental Engineering at the University of New Hampshire, explained, this multi-dam method matters because, "This approach allows us to analyze multiple impacts of a dam or system of dams, quantifying the trade-offs as well as potential co-benefits associated with a proposed management action or decision." The project is highly relevant given that hydropower is a major source of renewable energy in New England. More than 50 hydropower dams are scheduled for relicensing in the next decade, requiring states to make important decisions about their futures. The region is also home to thousands of iconic mill dams that are an integral part of New England's industrial history and continue to provide recreational and water supply benefits for many communities. But some of these mill dams pose safety and liability risks due to their age and poor condition. Both hydropower dams and mill dams can also have adverse effects on coastal ecosystems and economies, particularly because they often block the migrations of economically important fisheries. This project will empower stakeholders to make complex decisions about dams by taking the innovative step of combining the best available science with creative forms of community engagement. New England has received widespread recognition for its innovative approaches to the management of dams. "This new project will greatly enhance New England's role as a national and global leader in finding better ways to support informed decision-making about dams," said Richard Merrick, Chief Science Advisor and Director of Scientific Programs at NOAA Fisheries. Tom Burack, Commissioner of the New Hampshire Department of Environmental Services, sees the urgency and potential of this study. 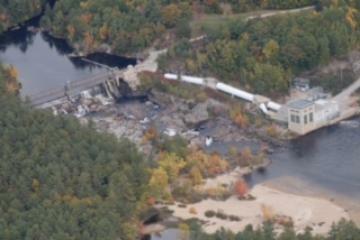 "New Hampshire has thousands of aging mill-type dams that were once used to power this nation's Industrial Revolution. Our Dam Bureau is continuously engaged with owners of obsolete dams and the communities in which they are located. This study has the potential to develop new pathways to decisions among many competing demands and perspectives," he said. The multi-state NEST team believes that solutions to sustainability challenges require a collaborative approach in which researchers from the natural sciences, social sciences, engineering, and the humanities combine their expertise. NEST's approach to problem solving also benefits from the local knowledge and know-how of diverse stakeholders representing government, business and industry, and non-governmental organizations. One of NEST's greatest strengths is its ability to develop customized solutions that are tailored to meet local needs and circumstances. NH EPSCoR, funded by the National Science Foundation, strengthens New Hampshire's research capacity and competitiveness to advance science and engineering for discovery and technological innovation. It's critical for the state to broaden the capacity to conduct research; to support business, industry and society with a workforce educated in science, engineering and mathematics; and to improve communication between scientists and the public. The University of New Hampshire, founded in 1866, is a world-class public research university with the feel of a New England liberal arts college. A land, sea, and space-grant university, UNH is the state's flagship public institution, enrolling 13,000 undergraduate and 2,500 graduate students across three campuses. 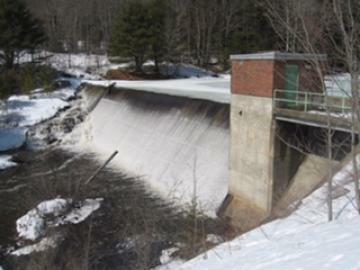 Caption: "This non-hydropower dam on lower Montsweag Stream in Maine was removed in November 2010 with the goal of restoring fish passage." Caption: "The Hiram dam on the Saco River in Maine is one of more than 50 dams in New England that are scheduled for FERC relicensing in the next decade."